Comic Hypnotist Rich Guzzi is the perfect choice for corporate event entertainment planning ideas. Too many times companies have settled for the same type of corporate entertainers year after year. Their employees or customers lose interest and the event lacks the enthusiasm to make it special. Why not take your corporate entertainment to the next level with Celebrity Hypnotist and Comedian Rich Guzzi? He will bring you the fresh and exciting corporate entertainment that will make you look good, plus make your corporate event a big success. Rich will create the perfect, custom made corporate clean program that will make your corporate event remembered for years to come by everybody in attendance. Rich Guzzi provides corporate entertainment programs for: Trade Shows, Conventions, Sales Meetings, Holiday Parties, Awards Banquets, Company Picnics and more. In fact, Rich also has other great entertainment ideas for just about any corporate event including: Team Building Workshops, Better Sales Seminars, Inspirational Talks, Motivational Speaking, Health & Wellness Programs, including Stop Smoking, Weight Loss, Stress Reduction and more. All delivered in a fun, entertaining, educational and of course, corporate friendly way. 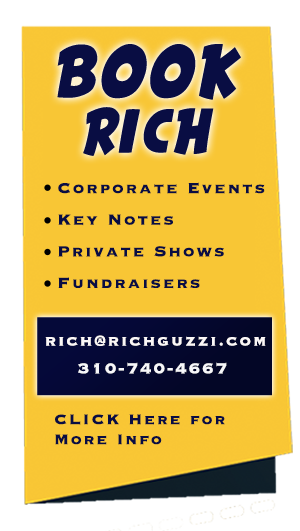 Who is Rich Guzzi and why is his brand of Corporate Entertainment the answer to what you have been looking for at your next Corporate Event? Watch the video below and see for yourself. So when you decide to hire entertainment for any type of corporate event, call the entertainer that companies say is the most amazing, funny and talked about part of the event. RICH GUZZI!